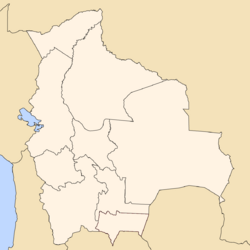 Potosí is a city in southern Bolivia, 56 miles (90 km) southwest of Sucre, the national capital. It is one of the world's highest cities, at an elevation of 13,290 feet (4,050 meters). 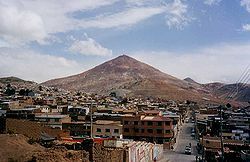 It sits on a barren plateau in the shadow of the Cerro de Potosí—sometimes referred to as the Cerro Rico ("rich mountain")—a mountain of silver ore, which has always dominated the city. Cerro de Potosí's peak is 15,827 feet (4,824 meters) above sea level. Potosí is a city deeply reflective of the pain of colonialism. From the discovery of silver there in 1545 until today, it has been a city of suffering for the indigenous population, while for Europeans, it was a mythical land of riches. While European powers claimed the riches of Potosi's mountain, indigenous laborers died by the thousands. Today it is a city of poverty. Once known as the "Imperial City of Potosi," the baroque architecture which incorporated Native influences was one criteria which qualified the old city as a World Heritage Site in 1987. Another criteria was the incredible impact that the riches of this mountain town offered in its role as one of the "invisible pivots of world trade." There is no satisfactory etymological study of the word Potosí. According to legend, circa 1462, Huayna Capac, the eleventh monarch of Peru, "set out for Ccolque Porco and Andaccaua, the location of his mines from which were taken innumerable arrobas of silver." (An arroba is a Spanish unit of weight equivalent to approximately 25 pounds.) "Before leaving there, he saw [Potosí], and admiring its beauty and grandeur, he said (speaking to those of his Court): 'This doubtless must have much silver in its heart'; whereby he subsequently ordered his vassals to go to Ccolque Porco ... and work the mines and remove from them all the rich metal. They did so, and having brought their tools of flint and reinforced wood, they climbed the hill; and after having probed for its veins, they were about to open those veins when they heard a frightening thunderous noise which shook the whole hill, and after this, they heard a voice which said: 'Do not take the silver from this hill, because it is destined for other masters.' Amazed at hearing this reasoning, the Incan vassals desisted in their purpose and returned to Porco and told the king what had happened; relating the occurrence in their own language, on coming to the word noise, they said 'Potocsí' which means there was a great thunderous noise, and from that later was derived (corrupting a letter) the name of potosi." 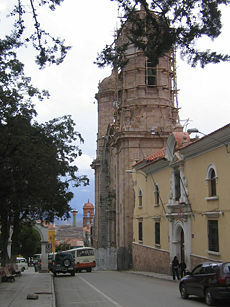 It is currently believed that the etymology of Potosí is Quechua. However, in Quechua the phoneme p'otoj does not refer to a thunderous noise, whereas it does in Aymara. Thus, if Potosí encompasses the idea of a thunderous noise, the locution would have an Aymaran root rather than a Quechuan. The actual sharp structure of the term is contrary to the nature of both Aymara and Quechua. Silver was discovered in Potosí in 1545, prompting the founding of the town the following year. Within 30 years its population exceeded 150,000, making it the largest city in the New World. Within 100 years of its founding it approached 200,000 inhabitants. In Spanish there is still a saying, valer un potosí, "to be worth a potosí" (that is, "a fortune"). For Europeans, Peru (Bolivia was part of the Viceroyalty of Perú and was known as Alto Perú before becoming independent) was a mythical land of riches. Potosí appears as an idiom for "extraordinary richness" in Miguel de Cervantes' famous novel satirizing chivalry, Don Quixote (second part, cap. LXXI). One theory holds that the mint mark of Potosí (the letters "PTSI" superimposed on one another) is the origin of the dollar sign. It is from Potosí that most of the silver shipped through the Spanish Main came. According to official records, 45,000 tons of pure silver were mined from Cerro Rico from 1556 to 1783. Of this total, 7,000 tons went to the Spanish monarchy. Indigenous labor, forced by Francisco de Toledo, Count of Oropesa through the traditional Incan mita institution of contributed labor, came to die by the thousands, not simply from exposure and brutal labor, but by mercury poisoning: in the patio process the silver-ore, having been crushed to powder by hydraulic machinery, was cold-mixed with mercury and trodden to an amalgam by the native workers with their bare feet. The mercury was then driven off by heating, producing deadly vapors. A typhus epidemic in 1719 claimed the lives of some 22,000 residents. By the early nineteenth century, the silver mines became depleted and the population dwindled to fewer than 20,000 inhabitants. The subsequent rise of tin mining spurred growth, though the town never regained its former glory. Still, the mountain continues to be mined for silver to this day. Due to poor worker conditions, such as lack of protective equipment from the constant inhalation of dust, the miners still have a short life expectancy, with most of them contracting silicosis and dying around 40 years of age. It is estimated that, in the past years of indigenous labor, roughly eight million Indians died, "eaten" by the Rich Hill. During the War of Independence (1809–1825) Potosi frequently passed between the control of Royalist and Patriot forces. During occupation there was anarchy and martial excess, and Potosi became unfriendly to the point where it could not be defended. As Spanish royal authority weakened during the Napoleonic wars, sentiment against colonial rule grew. Bolivia claimed its independence in 1809 as Spain was losing its power in the world. Sixteen years of struggle followed. On August 6, 1825, the republic was established and named for Venezuelan general and leader of South American independence, Simón Bolívar. In 1829, Andres Santa Cruz, one of Bolivar's generals, became Bolivia's first president. During his administration Bolivia enjoyed the most glorious period of her history with great social and economic advancement. But Santa Cruz was overthrown in 1839, beginning a period of successive corrupt dictatorships that ruled Bolivia until the late 1800s. Rebellions against them were frequent. 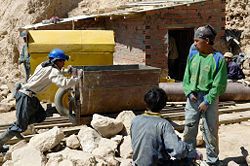 During this period, Bolivia became embroiled in several debilitating regional conflicts, which resulted in the loss of over half of its territory. During the War of the Pacific (1879 – 1983), Bolivia lost its seacoast, and the adjoining rich nitrate fields, together with the port of Antofagasta, to Chile. An increase in the world price of silver brought the country a measure of relative prosperity and political stability again in the late 1800s. During the early part of the twentieth century, with the silver mines depleted, the sale of tin, largely from Potosi, became the country's most important source of wealth. The city which essentially supported the splendor of Spain from the sixteenth to the eighteenth centuries while its own native peoples suffered the hardships of slavery, today is a city of poverty. There are a few mines in operation, with mining methods changed little over the centuries. The historic center of the city, once occupied by Spanish settlers, is home to a small middle class. This area is surrounded by a poverty belt whose residents are miners who work in the co-operatives. This area is surrounded by an even wider belt of poverty, home to those who have fled the countryside and come to Potosi to hire themselves out as unskilled laborers in the mines. Mining activity in Potosi slowed down only after the country's independence in 1825. The remains of this mining era includes numerous dams that controlled the ore-grinding mills and the Royal Mine Complex. Monuments of the once colonial city, 22 parish or monastic churches, patrician homes and the Royal Mint also remain, along with the contrasting humble 'rancherias' of the native quarters. Once known as the "Imperial City of Potosi," the baroque architecture which incorporated Native influences, was one criteria which qualified the old city as a World Heritage Site in 1987. Another criteria was the incredible impact that the riches of this mountain town offered in its role as one of the "invisible pivots of world trade." UNESCO is backing restoration projects for about 2,000 colonial buildings and is monitoring the conservation of the Cerro Rico, where the mining installations dating from colonial times are historic monuments. The Cerro Rico forms the backdrop of Potosi. A narrow street in Potosi. Coins minted in Potosi between 1760-1788. Entrance to Iglesia San Lorenzo. ↑ Fernand Braudel (1982), The Wheels of Commerce vol. II of Civilization and Capitalism illustrates the process (p. 326) in an eighteenth-century drawing in the library of the Hispanic Society of New York. ↑ K. Davidson and R. Ladkani (2005), Directors and Producers of The Devil's Miner (film). ↑ 3.0 3.1 Amalia Barron, Potosi's Silver Tears The UNESCO Courier. Retrieved June 14, 2008. ↑ UNESCO, World Heritage Nomination Retrieved June 14, 2008. Arzans De Orsua Y Vela, Bartolome. 1965. Historia de la Villa Imperial de Potosi: Edicion de L.Hanke y G.Mendoza. Brown University bicentennial publications. Providence, Rhode Island: Brown U.P. Cobb, Gwendolyn Ballantine. 1960. Potosí, a South American mining frontier. [Berkeley, Calif.]: University of California Press. Hanke, Lewis. 1956. The imperial city of Potosí; an unwritten chapter in the history of Spanish America. The Hague: Nijhoff. All links retrieved May 27, 2015. This page was last modified on 27 May 2015, at 16:49.